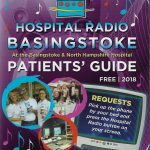 Chief Nurse of Hampshire Hospitals Donna Green has presented a show on Hospital Radio Basingstoke. She follows Chairman of Hampshire Hospitals Liz Padmore who did the same last October. Donna played requests from patients on D Floor and talked about some of the things hat have been happening in the hospital over the last few weeks including the NHS 70 celebrations and the recent major incident procedure that was instigated following a bus crash in Basingstoke. The programme went out live on HRB on 5 August, which happened to be the tenth anniversary of the station's new studio building arriving in August 2008. Liz Padmore, who is also leaving later this year, will return later in the year to host a second Music on Demand show.